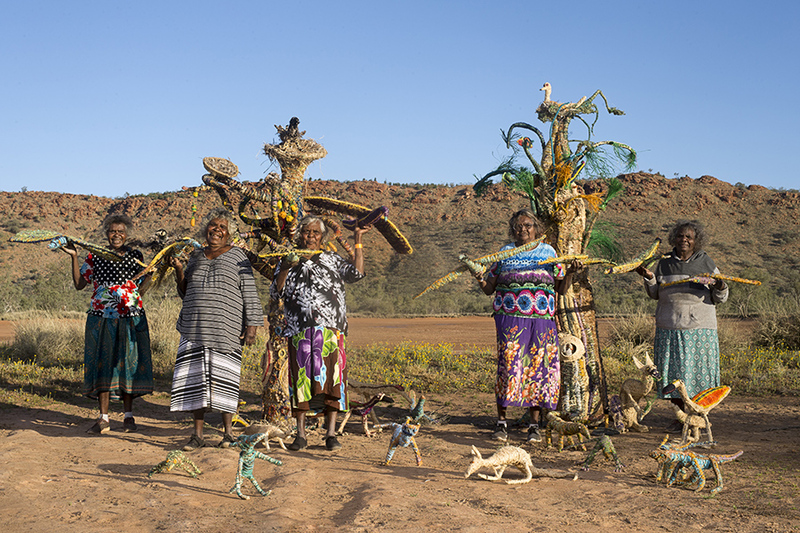 This wonderful collaborative tjanpi work was created for Nganampa Kililpil: Our Stars by 38 Weavers and Malpas (helpers) from communities which stretch across the wide APY Lands, assisted by Community Art Centre Workers and the Tjanpi Desert Weavers Field Officer. The central tree forms and conception of the work was unfolded by senior Weavers in Amata and Pukatja communities. The animals, birds and bush tucker offered by Pipalyatjara, Kalka, Fregon, Mimili and Iwantja communities. As they stitched, the Artists wove a story of their vast and abundant country into this glorious work. They talked of all their land provides with a reverence evident in the majesty of the tree forms, and in the detail of the little creatures which inhabit their shade. The Trees took on the form of the Spirit of life and bounty; the Anangu People implied as both recipient and participant in this wonderland. Recipient of the animals they hunt, which rest in the shade of the trees, the fruit which grows on the branches, the life giving water hidden within the trunk and roots, the creatures which lie in the ground beneath, as well at the very fabric of the trees which provides the necessary material for tools of life. Participant in the preserving all this, of spinning their knowledge into stories for their children, so that this reverence might continue. From Pukatja (Ernabella): Tjunkaya Tapaya, Imiyari (Yilpi) Frank Adamson, Niningka Lewis, Carlene Thompson, Milyika Alison Carroll, Atipalku Intjulka. From Amata: Ilawanti Ungkutjuru Ken, Nyurpaya Kaika-Burton, Mary Katatjuku Pan. Rachel Stevens (Fregon); Nyanu Watson (Pipalyatjara), Alison Treacle (Fregon), Vanessa Coulthard (Mimili), Katrina Roberts (Fregon), Rita Rolley (Fregon), Tjungurra George (Fregon), Gladys Roberts (Fregon), Amanda Kulyuru (Pukatja), Kathy Maringka, (Fregon), Ingrid Treacle (Fregon); Janet Inyika (Amata), Julieanne McKenzie (Pipalyatjara), Angela Martin (Pipalyatjara), Yangi Yangi Fox (Pipalyatjara), Pauline Wangin (Mimili), Angkaliya Nelson (Pipalyatjara), Nita Williamson (Amata), Nurina Burton (Amata), Imitjala Curley (Watarru); Julie Yangki(Mimili), Maringka Burton (Pipalyatjara). Yaritji Young (Amata), Maringka Tunkin (Amata), Lynette Lewis (Pukatja), Jayana Andy (Pukatja), Naomi Kantjuriny (Amata), Wanatjura Lewis (Amata), Wawiriya Burton, Amata.